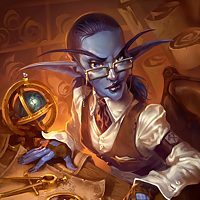 Hearthstone is too heavy on the RNG side to be of any significance in Esports. Yes, some skill is required and helps, but RNG is too prevalent right now. This is extremely obvious in that these tournaments always end up with a new set of faces. If skill outweighed RNG, you would see more consistency in the players but you don't. Look at the tournament choose your champion right now. None of those players are familiar at all. 02/24/2019 02:49 PMPosted by xluxThey removed "thank you" for being too toxic... But I'm sure they will add your dumb idea in no time !You can still say Thank you. You are thinking of "Sorry"
Am I missing something? The top deck in std is an aggro deck and in wild Odd Paladin is the 3rd best.I don't really understand how it's "dying".